Manti Te'o Fake Girlfriend, Bio, Is He Married To A Wife Now? Home Sports Manti Te’o Fake Girlfriend, Bio, Is He Married To A Wife Now? Manti Te’o is a linebacker in the NFL who plays for the New Orleans Saints. Like most footballers, the beginning of his football career has been traced to his high school. He is also known as the player who fell prey to a fake online girlfriend. Before he joined the NFL, Manti had his college education at Notre Dame where he played football with the school team and received various accolades. Read on and learn more about this footballer who happens to be a devout member of the Church of Jesus of Latter-day Saints. Born on January 26, 1991, the footballer was named Manti Malietau Te’o. His parents are Brian and Ottilia Te’o and, he isn’t their only child. Manti has five siblings, four sisters and one brother. It is known that he played football for Punahou School, a private co-ed institution in Manoa, Honolulu, the same place he had his middle school. Manti began playing football in high school in 2007. That same year, he won an award as the defensive player of the year as well as the Gatorade state player of the year. Finishing his high school junior year with exceptional records that earned him massive attention, he improved on his performance as a senior and earned his 2nd straight Gatorade State Player of the Year Award. That’s not all, he bagged a good number of other awards including being named to First-Team All-American and as the National Defensive Player of the Year 2008. In view of the huge success of his high school career, it wasn’t a surprise that Manti Te’o was a reputed 5-star recruit who had over 30 colleges offering him scholarships. For reasons best known to him, he picked the Notre Dame and signed up for active college football career with them. Te’o kept up with his impressive performance as he blazed for the Notre Dame Fighting Irish football team; this was from 2009 to 2012. He picked up various awards in the later year. Apart from being a Unanimous All-American, he received the Lott Trophy, the Lombardi Award, Bronko Nagurski Trophy, the Butkus, Maxwell, Walter Camp, and Chuck Bednarik award. With an excellent college football career, he declared for the 2013 National Football League drafting and was selected as the 38th overall in the 2nd round of the year’s NFL draft by the San Diego Charger. The team later signed him to a 4-year contract worth $5 million. As reported, the deal guaranteed $3.1 million and handed the Linebacker over $2 million signing bonus. Manti remained with the side until March 2017 when the New Orleans Saints came calling to have him join their squad. This saw him ink a two-year deal with the team. Even though it isn’t out of place for many to assert that this Linebacker hasn’t equaled the attainments of his high school and college career as a professional, there is no denying that he is a remarkable footballer. As of the Week 1 of the 2018 NFL season, his NFL career statistics boast of 288 total tackles, 1.5 sacks, 2 interceptions, a forced fumble, and 12 pass deflections. One ugly incident that Manti Te’o may never erase from his mind was his experience with his mysterious online girlfriend named Lennay Kekua; she allegedly died of Leukemia in 2012. 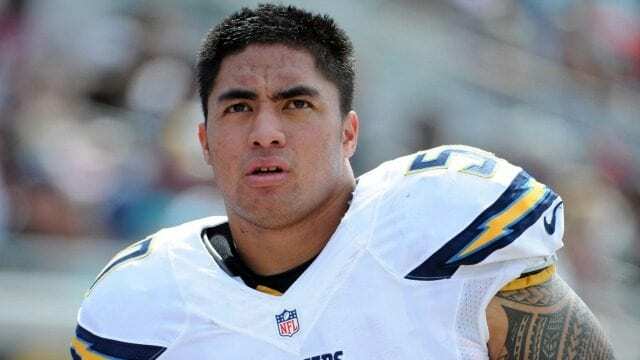 Manti announced to the media that his grandmother and girlfriend had died on the same day – September 11, 2012. Little did he know that the said girlfriend was just being impersonated by Ronaiah Tuiasosopo. It took the intervention of reporters like Timothy Burke and Jack Dickey to unravel the hoax. It is said that the hoax was uncovered through a mail Te’o received in January of 2013 which promptly led to the person behind the scam. Ronaiah Tuiasosopo, a family friend of Manti was duly identified as the impersonator. Ronaiah used the pictures of Diane O’meara, his former high school mate to carry out the crime. Is He Married To A Wife Now? 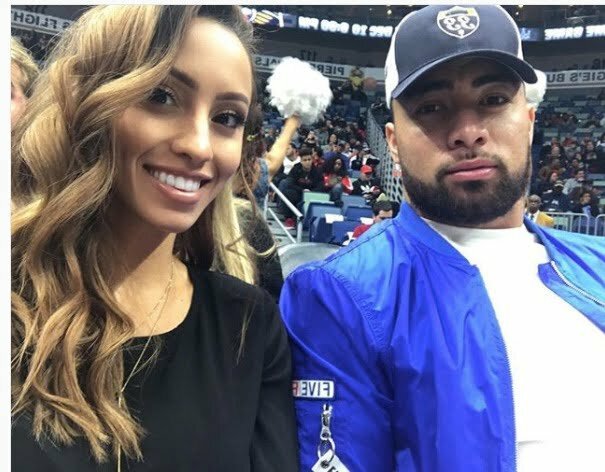 Manti Te’o is still unmarried, however, he is currently dating the beautiful Instagram Model and fitness trainer, Jovi Nicole Engbino. It is said that the two met 3 years after the Manti Te’o fake girlfriend drama. Since 2016, they have been spotted together publicly on several occasions and as far as we can tell, what they share have been waxing stronger.